Getting Crafty with Jamie: Thankful for YOU! See this Holiday Catalog packed project and how universal it is for an all year long look!! I'm sooo Thankful for the wonderful stampers who support me, my Stamping Business and love of paper crafting!! This sweet card is rich in elegance, gilded with silver and the Thankful is written all over this baby! It is SURE to be a HIT at my upcoming class!! 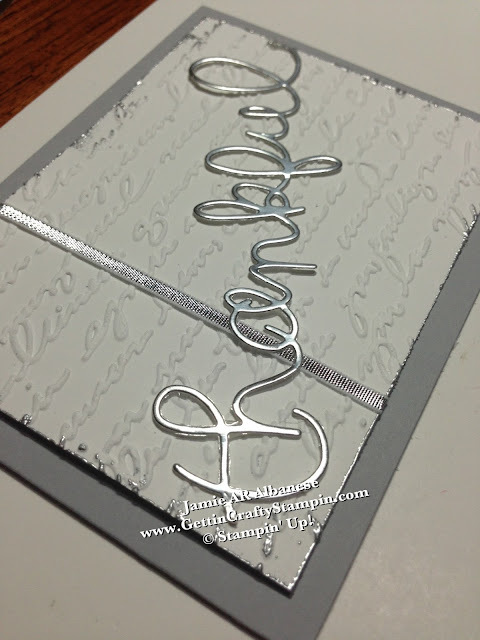 The new Smoky Slate card stock (#131202) takes on a silver look when you layer these new shiny highlights! Embossing this Whisper White card stock (#100730) with our new (from the Holiday catalog) Pretty Print Textured Embossing Folder (#132175) for this beautiful neutral script impression. Rubbing the edges of this embossed card stock in our Versa Mark pad (#102283) and the Silver embossing powder (#109131) the Heat Tool (#129053) gives this a Gilded edged look! Tied together with the new and stunning Silver 1/8" Ribbon (#132137) and the love is sure to shine through!! Like in fashion, Metallic is all the rage!! 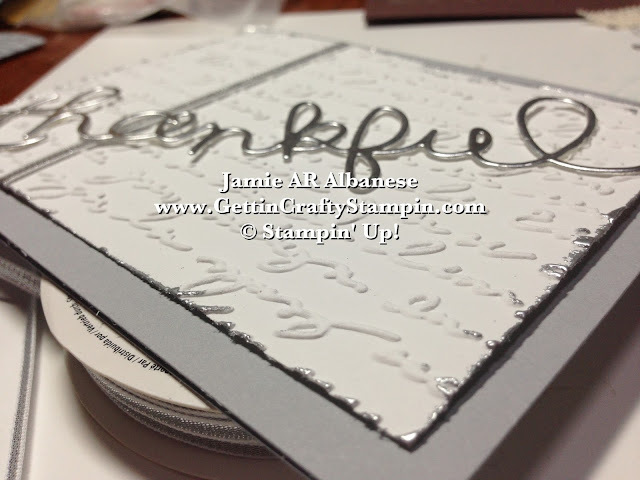 These Metallic accents really make this card to POP! What a fun way to take some fun Holiday Catalog items and showcase how it's available for use all year long!! See the FUN I had and brought home from Convention at my upcoming classes!! Don't forget to RSVP and see, too, how to take my classes for FREE! Leave me a comment and let me know what you think! Remember to Pin this, Share it on Facebook, Twitter, Instagram, LinkedIn, Google+ and to JOIN ME on these paths in life when you Follow Me on these avenues (as well as YouTube, The Vine and more!) in addition to my Mailing List! I'm so thankful that you came by! Have a shiny, gilded day and visit often, I try to post daily!